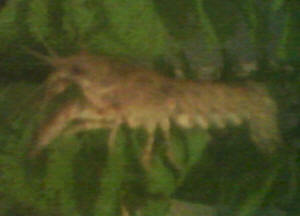 I got this one from a goldfish feeder refugium at a pet store. It was kept in the dark for quite some time. So I think its color is faded a bit. It's about 5 inches long. 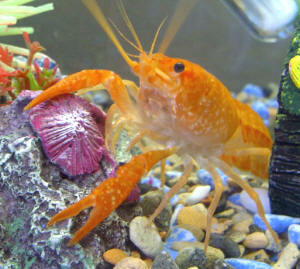 How to identify whether an orange crayfish is a CPO dwarf or whether it's the bigger clarkii one? The images online look very similar. Because I was expecting this to grow to only around 3 inches max and it's in a 5 gallon tank. But I noticed it was already 2.5 inches plus. So I'm wondering if it's a fully grown cpo or a very young clarkii? And I'm not really sure about the scientific names as well. Sorry for any mistakes! The pet store guy has no idea about it. And I'm not from the US. <You're welcome! 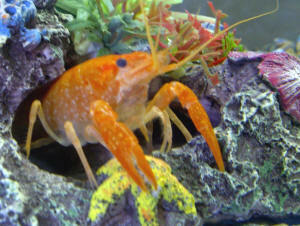 FWIW, the "Bright Orange Crayfish" is an artificially bred form of Procambarus or similar. True Cambarellus, at least in the UK, are rarely traded, and when they are, sold at small sizes and premium prices. 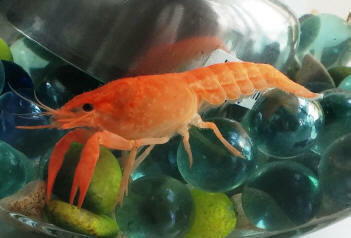 Hi WWM crew, attached are pictures of my new little crayfish - any idea what species he/she is? 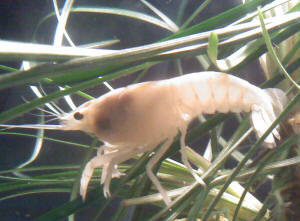 I thought perhaps Procambarus clarkii? <Ask around at the fishing/bait shops in your area re... It is likely introduced (non-native)... They will most likely know. 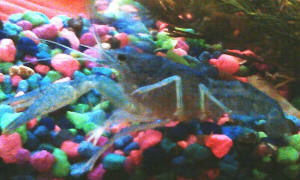 I recently bought two crayfish from Petco that were labeled as "Vanilla Lobster" and "Asian Blue Shrimp." Both look exactly identical except the Vanilla Lobster is completely white and the Asian Blue Shrimp is, well, blue (but not a dark hue like that of and Electric Blue). 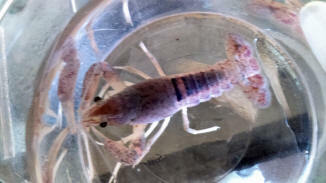 I live in WA and LFS label crayfish as lobsters and shrimp to get around a law preventing the selling of crayfish as they are an invasive species and people release their pets into the wild regardless of how wrong it is. 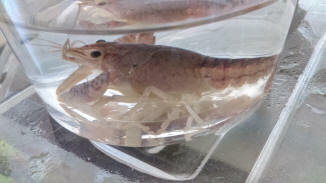 I was wondering if you could please help me identify what species of crayfish they are. I have enclosed pictures to hopefully help. 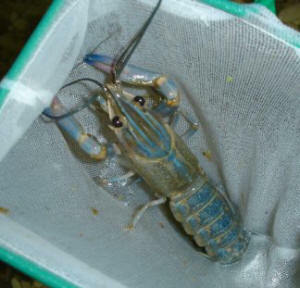 The picture of the Blue Crayfish is not a picture of my specimen (mine was avoiding my camera at all costs) but of one that is identical. P.S. 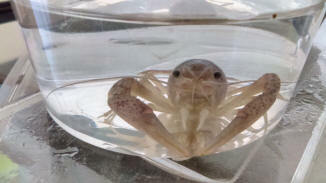 Sorry about the two pictures of my white crayfish being so large. I don't know how to make them smaller.